I am an only child and I hate it. I’ve always felt a deep loneliness and longing for a sister. I prayed for one when I was four or five. I looked in every closet and under every bed, but I didn’t find her. Sometimes, I think I’m still looking. Nine years ago, I was blessed with twin girls. I often remind them how fortunate they are to have each other. I think it will be a few more years before they understand that. 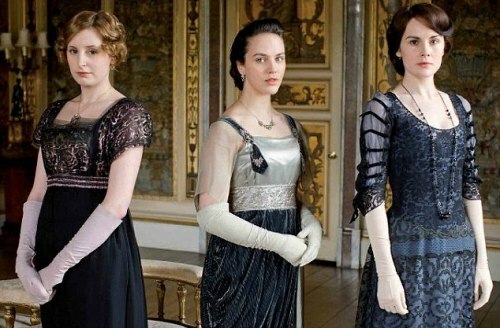 When that time comes, I’d like to show them Downton Abbey. The relationships between Mary and Edith sadden me. From the beginning, it seems that Edith despises Mary for her shallowness and it’s anybody’s guess as to why Mary is so cold to Edith. They both make efforts to derail the happiness of the other. I hope my girls will see that those efforts do nothing but cause pain for all involved. It is wrong to desire that your sister or brother come to ruin. I’m an only child who wished for a sister too. I got three stepsisters very late in life, so that was kind of cool. That’s not why I’m leaving this comment. I wanted to tell you that I have a friend (who has a sister) and was so disturbed by Edith and Mary’s relationship on DA that I’m not even sure she’s even still watching the show!!! Crazy, right? I hope as the show goes on that they will learn to love each other better.